The Memorial Candle Program has been designed to help offset the costs associated with the hosting this Tribute Website in perpetuity. Through the lighting of a memorial candle, your thoughtful gesture will be recorded in the Book of Memories and the proceeds will go directly towards helping ensure that the family and friends of Lorraine Morrill can continue to memorialize, re-visit, interact with each other and enhance this tribute for future generations. Lorraine Viola Babcock, born November 27, 1923, in the town of Green Valley, Wisconsin, was the daughter of the late Hollis and Marie (Gablein) Babcock; third born in a large family of eleven children. She attended school there, was baptized and confirmed in Grace Lutheran Church. December 1941, she was united in marriage to Floyd P. Morrill. He preceded her in death, March 4, 1993. Lorraine chose to live a simple life. She was a homemaker and long-time member of St. John Lutheran Church in Mosinee. She took pleasure in her role of wife and mother to two children. She loved travelling with husband Floyd. After their two children, Bonnie and Gary, were grown up and left home, the couple visited 48 states, Canada, and Mexico. 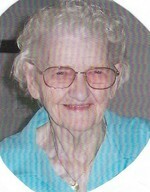 Lorraine also enjoyed outings and reunions with family; enjoyed parades, snowmobiling, country music and dancing. She especially took delight in membership with the Moon Mothers Club. Lorraine attended the first Moon Mothers Club’s meeting held in Moon School when her children were youngsters; and she was involved with the club for its duration of 70 years. Lorraine passed away peacefully at Atrium Post Acute Care Center in Marshfield having been diagnosed with Peritereal cancer. She is survived by daughter Bonnie (Morrill) Sklander of Hoffman Estates, Illinois, son Gary (Barb) Morrill, Elk Grove Village, Illinois; five grandchildren, and nine great grandchildren. Also survived by four sisters: Opal Krueger, Evelyn Doering, Yvonne Vesely, Ellen (Leroy) Martin. And survived by two brothers: Gerald (Janet) and Howard Babcock. Lorraine was preceded in death by husband Floyd, sisters Ethel Hirsch and Delphine Werther, brothers Norman, Robert, and Vernon, and son-in-law, John R. Sklander. To send flowers to the family of Lorraine Viola Morrill (Babcock), please visit our Heartfelt Sympathies Store.